I can’t recall the rest, but I know that I hadn’t the foggiest idea what paprikash was back then – and until today had never made it. Turns out chicken paprikash is a tasty Hungarian chicken stew in a tomato sauce enriched with sour cream, and very simple to make. Taking the girls into consideration, I opted for sweet paprika, then upped the spiciness for the adults. Preheat the oven to 400°F (200°C). Heat a large, oven-proof pot over medium heat. Melt the oil and a tablespoon of butter together. Season the chicken thighs with salt and pepper, and sear on all sides. Remove from the pan and set aside. Drain all but a tablespoon of oil from the pot, and adjust the heat to medium. Add the onion, and sauté until softened. Add the garlic and cook for a few minutes more. Sprinkle over the flour and paprika, and cook for a couple of minutes, then add the chopped tomatoes and stock. Bring to a simmer and return the chicken to the pot. Cover and bake for thirty minutes until the sauce is thickened and the chicken cooked through. When the chicken is almost ready, boil a large pot of salted water and cook the egg noodles. Drain and toss with the remaining two tablespoons of butter. Remove the chicken from the sauce and whisk in the sour cream. Season to taste. 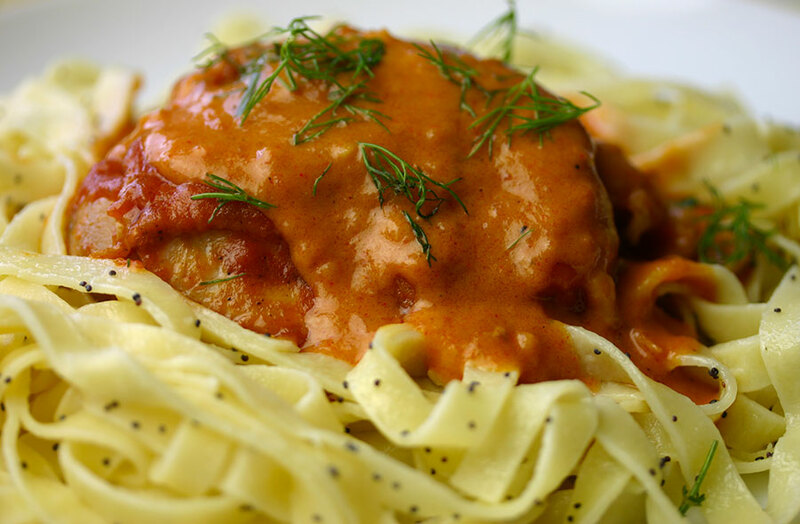 Arrange the chicken on a bed of noodles, the ladle over the sauce. I wish I could remember the whole thing. I think it was “rigatoni, macaroni, turn around, something , something, touch the ground.” We used to do it with a long skipping rope you doubled so there were two ropes turning at once, called double Dutch. I wondered if I started skipping, would the words just come back?